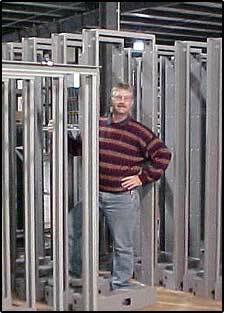 Custom Cabinets and Racks (CCR) of Topeka, Kansas is small division of a medium-sized fabricator, but it serves some pretty large customers. Like several of the major phone companies. CCR builds the special cabinets, racks and trays to house the network servers, switches and other mission-critical equipment that keep the nation's communication carriers running. CCR uses 11 and 12 gauge sheets from 48 to 60 inches wide and 9 to 12 feet long – anywhere from 40,000 to 70,000 pounds a month. Six months ago, CCR replaced all that P&O with SCS. To turn those sheets into precision custom cabinets, CCR does shearing, punching, bending, tapping/threading, grinding, welding and painting. That means material is handled and moved around the shop quite a bit. "You can't believe how much cleaner the shop stays with SCS," states Stan Vallis, Operations Manager at CCR. "Sure, we've cut down our purchases of gloves, towels and solvent, but there's also an intangible benefit to getting rid of oil and having a cleaner workplace." Vallis sees that welding SCS is cleaner too - less 'smoky' than welding P&O - but cannot quantify the reduction in fumes. An area where he is quantifying SCS savings is painting and paint prep. CCR uses an iron phosphate solution to cleanse parts prior to its powder coat process. "We have a 2600 gallon wash tank and when using P&O we changed that out every month," explained Vallis. "That's $600 worth of chemicals, plus the water and the downtime where we can't paint." After the switch to SCS, Vallis closely monitored the wash tank and found that he did not need to replace the solution every month. After five and a half months when he did replace the wash solution, here's what he found: "With SCS there was only a half inch of sludge - dirt, chips and oil - in the bottom of the wash tank. And that's after five and a half months. With P&O, we normally had 1.5 to 3 inches of sludge every month." More important, quality of the paint finish is notably better. Vallis notes, "The SCS surface is so smooth that the paint finish is smoother. And with P&O we couldn't avoid some oil or contaminants clinging to the parts despite rinsing. This often caused a "fisheye" blemish on the paint finish. That meant stripping and re-painting the part. Since the switch to SCS, that rework expense has been virtually eliminated." CCR has been buying SCS at about the same price as P&O, so the savings goes straight to the bottom line.